Speakers Ghaith Al-Omari (left) and David Makovsky visited this university to talk about the relationship between the U.S. and Israel. Jacqueline Chase/Mitzpeh. Though America’s relationship to the conflict between Israel and Palestine may seem troubling, David Makovsky and Ghaith Al-Omari say there is still hope for the next generation. 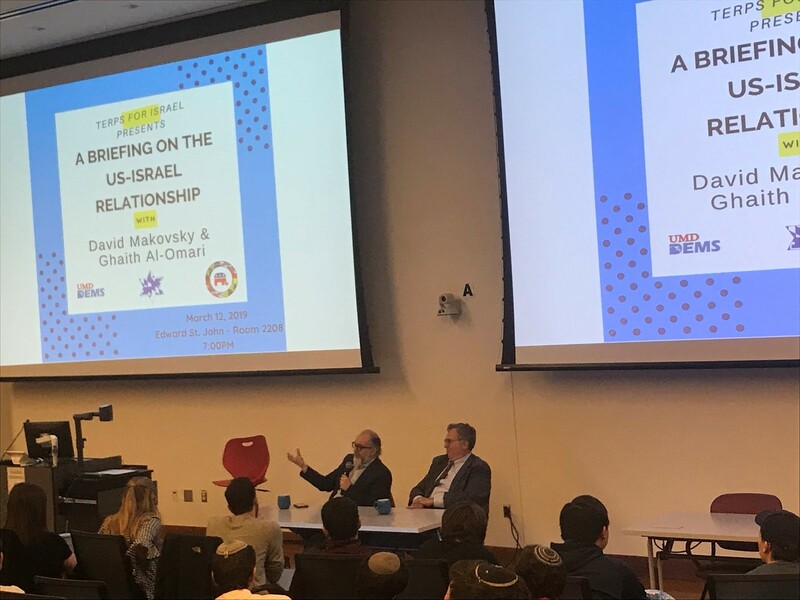 Terps for Israel welcomed experts Makovsky and Al-Omari to this university for a discussion of the Israeli-Palestinian conflict, as part of Hillel’s Israel Week programming. Makovsky’s record includes his work as senior advisor to the special envoy for Israeli-Palestinian negotiations in the Office of the U.S. Secretary of State in the Obama Administration. Al-Omari is the former executive director of the American Task Force on Palestine and advisor to a team negotiating a Palestinian state. The two have traveled to dozens of schools together, including the University of Santa Barbara, the University of Chicago, Brown University and Columbia University. Terps for Israel invited the two experts to this university to bring clarity to these relationships and to give students context, said group President Jenn Miller. Noah Green, a political cabinet member of Terps for Israel, attended the event to support the organization and hear what the speakers had to say. “I think it’s a good opportunity for all Maryland students to really learn about the conflict from an unbiased and expert source,” said Green, a freshman finance major. Makovsky said that he does not believe a complete solution to the Israel-Palestine conflict is possible at this time, but smaller agreements now could lead to a full resolution in the future. He recommended both sides choose their biggest issue and focus on resolving those, instead of trying to solve every issue in one agreement. “One of the issues, and to my mind this is the core of the current crisis we have, is a sense of loss of faith, a sense of disbelief,” Al-Omari said. He stated that both sides want peace, but they do not believe the other side wants peace. He also spoke about the importance of focusing first on issues that affect the daily lives of both Israelis and Palestinians. Both men said they were skeptical of President Donald Trump’s plan, but still believe that the U.S. can help. Al-Omari said the U.S. should continue to aid Palestinians and support the people, many of whom would like a change in their government, without taking over. Dozens of students attended this event, which was co-sponsored by College Democrats and College Republicans, in the Edward St. John Learning and Teaching Center. Students were given the opportunity to ask questions during the event and speak to Makovsky and Al-Omari afterwards. “I thought that it was really interesting and really important, especially to hear that there are things that people on both sides agree with,” said freshman information science major Aliza Mintz. No Replies to "Experts discuss U.S. relations with Israel, Palestine at Terps for Israel event"